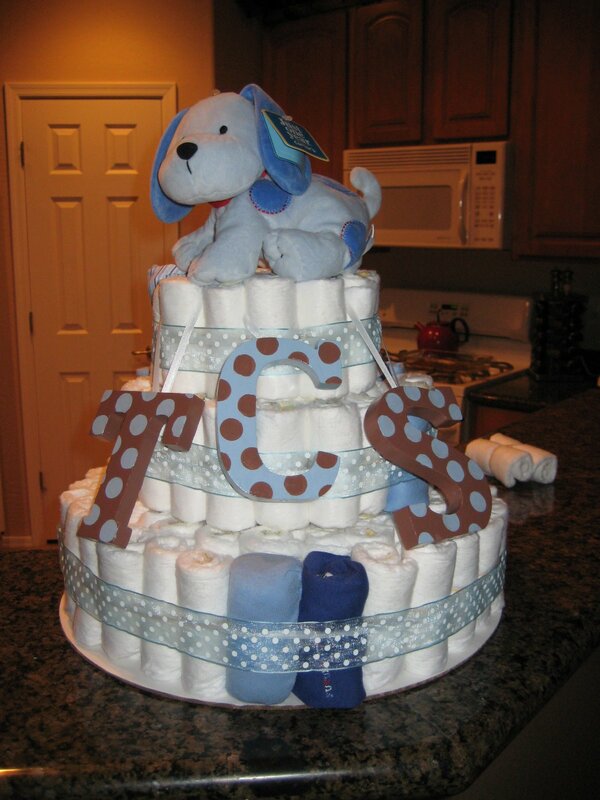 There are SOOO many ways to make a diaper cake. I will tell you how I did it and then mention a few alternatives. You can use which ever size you like. I would recommend size 1 or 2 because some babies never wear newborn diapers. I chose size 2 so my friends can enjoy the cake a little longer before tearing it apart. You can decide how many you want to use based on how big you want to make your cake. I think minimum is about 70 diapers. For mine, I used 120. Don’t try to use the ones around your house. You won’t have enough. Purchase a bag of multi-sized bands. You will need LOTS of small ones and several very large ones. This is where you get to exercise your creativity. Whatever you want goes. I think the nicer cakes stick with a color and or theme. For mine, I used a plush puppy, 5 onesies, 3 hats, 3 bibs, 2 pacifiers and the initials of the baby. You can use as many or as little as you like. You can stuff the gifts in the place of diapers, or drape them over the cake. I prefer to keep the cake as neat and clean as possible and stuff the gifts (except for the toy-topper and the initials). Step 1: roll your diapers. Start at the opening end and roll the diapers tight (with the pattern on the inside of the diaper). Secure with a rubber band. [you can chose to roll all your diapers at once or by cake layer] Make sure the rubber band is in the middle of the diaper and is clean and neat. Step 2: Form diapers into your first layer. A good place to start is with 8 diapers (1 in middle and 7 surrounding the one) and secure with rubber band. Make sure the ends of the diapers all face inward so it looks neat and tidy. You can use the 8 diapers as the small layer, or add another “ring” of diapers around that for your first layer. (for mine, I used the 8 plus an additional “ring” of diapers- but remember, each layer gets progressively larger, so make sure you have enough diapers). Step 3: Form your second diaper layer. Start with the same 8 diaper layer and continue adding additional diaper “rings” until you have one more ring than the previous layer. Step 4: Form your third layer. (repeat step 3) You have to get a little creative with the rubber bands once your layer gets past a certain size, but you can do it (I wrapped half of the last ring around half of the rest of the layer and then again with the second half)! Step 5: Stack the layers on top and arrange them like you want them, then shimmy the dowel down the center to all three layers to secure the layers. Step 6: Tie the ribbon around each layer to hide the rubber band. Secure with double sided tape or glue gun. Step 7: DECORATE! However you like- replace some diapers with goodies, add a cake “topper,” drape gifts or signs on the cake or anything else you can come up with. -instead of using dowels, start your cake using an object or gift (i.e. empty paper towel roll, a bottle of baby powder with a bottle on top, a bottle of champagne) and form your layers around the gift. Wow. That is a LOT of work. I’ve seen it done once (helped roll diapers), but never done it myself. Wow. Great I can’t wait to try it!!! !